1.2 What is wheat germ? 1.3 Why is the germ removed in the refining process? Wheat germ is that part within the wheat grain that contains more food properties. The germ is the seed from which the new plant will germinate. In this part of the wheat, which is about a 2.5 or 3% of the total weight of grain, massive numbers of concentrated vitamins, minerals, protein and fats can be found. Unfortunately, modern society has shifted to the consumption of bread made with refined flour, a product which has previously removed the germ. This has deprived humanity of the intake of grain products rich in nutrients. Why is the germ removed in the refining process? As mentioned above, wheat germ is rich in fatty acids. Over time, these acids are more likely to become rancid, so the bread obtained from flour that contains these acids produces bread with lower-quality and a rather unpleasant taste. Therefore, in the refining process, in addition to eliminating the outer layer or pericarp, the germ is also removed along with the aleurone or layer surrounding it that is also rich in protein and fat. Thus, the grain of wheat is reduced to the endosperm, which constitutes almost 80% of the total weight of the grain. What remains after the refining consists of carbohydrates (starch) for the most part, and proteins. From this mass it is obtained what is known as white flour. – Wheat germ contains many essential fatty acids: The wheat germ contains 9 times more amount of fatty acids than the refined flour. In addition, it is necessary to emphasize that the main one is linoleic acid or Omega-3. This type of fatty acid is very beneficial, for example, for the organism since it reduces cholesterol, triglycerides and prevents the formation of clots in the blood. All this grants a great power to wheat germ to improve the circulatory system, preventing the onset of vascular disease. – Wheat germ is very very rich in vitamin B: Wheat germ contains very large amounts of Vitamin B. We know the importance of this vitamin for healthy nervous system and the production of hormones, enzymes or proteins, as well as strengthening the immune system . This vitamin is very important for the elderly and for vegetarians, who have a strict diet with no feeding of animal flesh, eggs, milk and derivatives. Within this group of vitamins it is necessary to highlight the richness of wheat germ in folic acid, which importance is crucial for pregnant or nursing women since part of this vitamin is transferred to the fetus or baby. A lack of this vitamin may cause problems of improper growth in the baby. Equally important is this vitamin for people with frequent bowel problems, such as those with normal bowel intestinal diseases (Crohn’s disease, ulcerative colitis or similar) since these people present a bad absorption of this vitamin. No less important is the wealth of wheat germ in pyridoxine, which deficiencies produce problems in the skin or the hair, such as seborrhea or hair loss, dry skin, etc. This vitamin, among other properties, also helps patients with diabetes to maintain more stable levels of blood sugar, helps thinning the blood, reduce symptoms of pre-menstrual syndrome, favors memory or reduces asthma attacks. Wheat germ contains high amounts of thiamin, niacin and riboflavin, three vitamins of the B vitamin group important for the proper functioning of the body. Many of the refined breads contain riboflavin because some Governments, given the importance of this vitamin, force to add it to the refined flour. – Wheat germ is very rich in vitamin E: Among the vegetables, those which contain more Vitamin E are those rich in fat. Among them, the wheat germ. This vitamin is one of the most powerful antioxidants, capable of counteracting the negative effects of free radicals on the circulatory system, preserving the the health of your mind or protecting your vision. – Wheat germ is very rich in minerals: It contains high amounts of potassium, a very interesting mineral, for example, to maintain the hydric balance in the body and counteract sodium. This will be very beneficial to keep heart rate or stabilize blood pressure. With 842 mg / 100 gr, wheat germ is one of the richest dietary supplements in this mineral. Wheat germ is very rich in iron, necessary to prevent anemia, nose bleeding, hemorrhages, or the restless legs syndrome. We recommend a special intake of products containing iron in the diet to lose weight because very strict weight loss diets can lead to low levels of iron in the body. It is also suitable for strict vegetarians diets, because the lower absorption of non heme iron from vegetables. Equally important is its magnesium content. This mineral is necessary, among other things, for the formation of bones and teeth. (It helps to form the enamel of teeth and healthy bones). It is part of the body’s metabolism. (By activating certain enzyme. It is involved in basic bodily functions, including, for example, protein synthesis, metabolism of carbohydrates, the formation of DNA). 100 g of wheat germ provide half the daily recommended amount for an adult. Wheat germ is very rich in phosphorus and calcium. Cereals are the plant foods with the highest proportion of these minerals. This supplement emphasizes especially phosphorus. The deficiencies of these minerals take the form of weakness in the bones, nails and teeth, overall weakness throughout the body, lack of appetite or low resistance to diseases. Eating these supplements may help prevent some of these symptoms. Do not forget the important role exerted by calcium in preventing osteoporosis. – Wheat germ is very rich in proteins: Protein is needed for the construction and regeneration of the body. Its importance in the formation of enzymes and other chemical processes is vital. Wheat germ is rich in protein. Its protein value (23.15 g) is higher than soybeans (16.64 g) and is very close to the beef (31.5 g). Including this supplement in our diet is a health guarantee. Our nails, our muscles, our hair will show a great vitality and strength. – Wheat germ is very rich in fiber: One tablespoon wheat germ contains more than 1 gram of fiber. Fiber is necessary to activate the bowels and prevent constipation. It has been also proved the relationship between consumption of foods rich in fiber and the prevention of many cancers, including colon cancer. This component is also important in controlling diabetes or heart diseases. 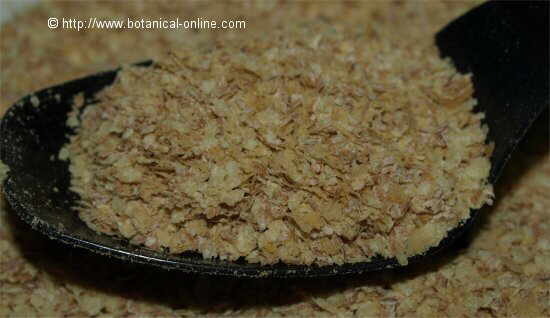 Wheat germ is used extensively in cosmetics for skin care, particularly skin care. Because of its richness in fat, it is frequently used for the elaboration of creams for dry skin or masks for wrinkles. How to eat wheat germ? It is important to incorporate this dietary supplement in the daily diet. There are many ways of eating. It is sold in health food stores or in supermarkets. It is important to purchase a trusted brand, guaranteeing that this wheat product was obtained from organic farming. The easiest way is to add it to your yogurt or muesli every morning at breakfast. You can also add it to soups or any more or less liquid preparation, without changing the taste of it too much. In the market you can buy many products in which wheat germ has been incorporated, like cookies, whole grain pastries, muffins, etc. Another possibility is to add wheat germ to the flour from which we will prepare our homemade bread. Once opened the wheat germ container, it should be stored in the refrigerator, since it can become rancid. It is important to keep in a plastic bag or in a well sealed airtight container in the refrigerator. If kept in these conditions, it can be preserved for more than half a year. More information on other nourishing supplements.